In Giurgiulesti, the liner hoisted the flag of Belize. 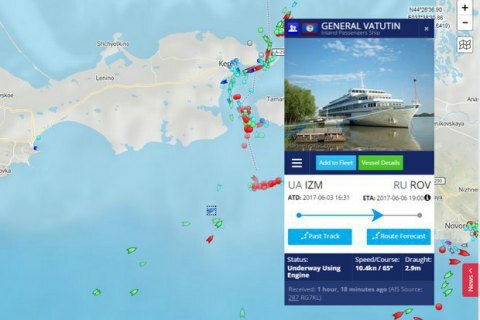 General Vatutin, a Ukrainian river-sea cruise liner has without warning changed course and is now heading for Russia. An Odessa online publication, Dumskaya, said the liner left Kyiv on 1 June down the Dnipro apparently for a "hot tour" cruise. However, without calling in the next point of the cruise, Odessa, she moved from Kherson straight to Ismail and then to Vilkovo. The liner is owned by Cyprus-registered Breeze Cruise Lines Ltd, home port Kherson, according to Ukrainian Navigation Register. On 5 June, at 5 o'clock in the morning, Gen. Vatitin left Vilkove and suddenly headed for the Russia-occupied Crimea, where it spent the night near the southern shore of the peninsula, and resumed movement along the Crimea's southern shore . According to AIS marine traffic system, the vessel is going to Rostov-on-Don. There is no explanation for such strange behavior yet. Chervona Ruta cruise travel operator told Dumskaya that the company has no information on the vessel’s movement. Later, Dumskaya reported citing Chervona Ruta that Gen. Vatutin was sold to a Russian company and raised the flag of Belize in Moldovan Giurgiulesti.